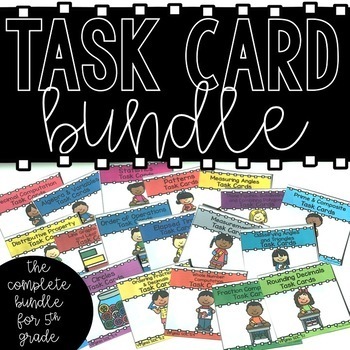 This 20 set task card bundle has 480 task cards that will keep your students engaged throughout the year! 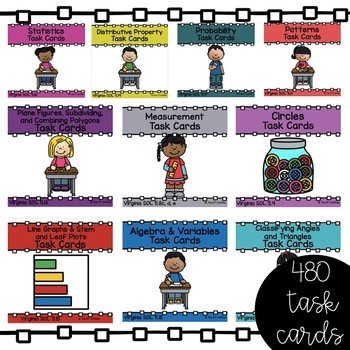 These task cards are perfect for scoots, centers, and more. Each set of task cards comes with a student recording sheet and teacher answer key. This set includes 24 task cards that include rounding decimals to the nearest whole number, tenth, and hundredth place. Aligned with Virginia SOL 5.1. This set includes 24 task cards that include identifying angles (acute, obtuse, & right) as well as triangles (equilateral, isosceles, & scalene). Aligned with Virginia SOL 5.12. This set includes 24 task cards that include solving single-step and multi-step practical problems involving addition, subtraction, multiplication, and division of whole numbers. Aligned with Virginia SOL 5.4. This set includes 24 task cards that include solving practical problems that involve area, perimeter, and volume in standard units of measure. The students will identify whether the application of the concept of perimeter, area, and volume is appropriate for a given situation. Aligned with Virginia SOL 5.8. This set includes 24 task cards that include classifying and measuring right, acute, obtuse, and straight angles. 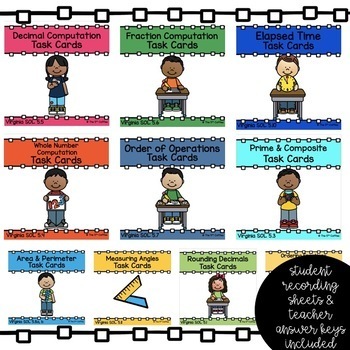 This set includes 24 task cards that include representing and identifying equivalencies among fractions and decimals. The students will compare and order fractions, mixed numbers, and/or decimals in a given set, from least to greatest and greatest to least. Aligned with Virginia SOL 5.2. Aligned with Virginia SOL 5.14b. This set includes 24 task cards that include simplifying whole number numerical expressions using the order of operations. Aligned with Virginia SOL 5.7. This set includes 24 task cards that include solving single and multi-step practical problems involving addition and subtraction with fractions and mixed numbers. Aligned with Virginia SOL 5.6. Aligned with Virginia SOL 5.17. This set includes 24 task cards that include investigating and recognizing the distributive property of multiplication over addition. Aligned with Virginia SOL 5.19. -creating a problem situation based on a given equation, using a single variable and one operation.